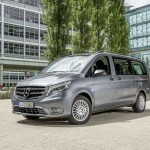 Home Mid & Heavy Mercedes Vito, The Ultimate Mid-size Van? 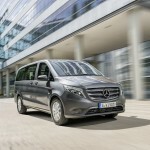 The new Vito is both eye-catching and functional with a high quality, driver-friendly cockpit. Its engines promise great fuel efficiency. With its longitudinally or transversely installed engines and a choice of rear-wheel, all-wheel and – most recently – front-wheel drive, the Vito is uniquely versatile. 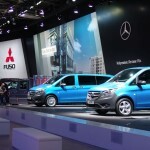 At IAA Hanover, I saw, for the first time, the complete new Vito. At the end of same day, Daily won the trophy „Van of the year” – I will never have trust in all kind „…of the year”. Actually, even in the past, I did not have any trust in these awards. Now, when I write about the Vito, I laugh thinking about the van buyers who will reject Mercedes Benz in favor of the Iveco, only because of this award. But my story has to be about an amazing van, not about a prize that nobody cares for! So, in the first oficial pictures, the Vito looks more like a passenger car, but in reality, it is a real van (or a minibus). Starting with that uncommon matt “south seas blue” paintwork and finishing with the taillights on the new Vito are unmistakable. Even at first glance, the new Vito’s bodywork exudes high quality through aspects such as narrow, even joints and the streamlined, inconspicuous guide mechanism for the sliding door. It is a lesson of design, even for the Italians. 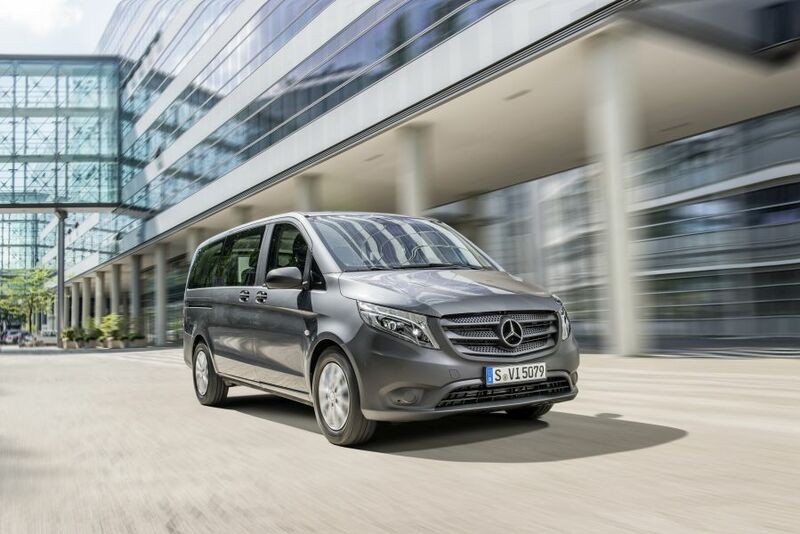 On the new Vito, every detail combines form and function. The optional roof rails are an example. 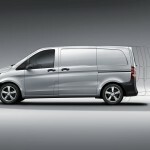 They provide the base for carrier systems, while still keeping the overall height of the new Vito below two metres. This is important in multi-storey car parks, garages and automatic car washes. I have to be little bit of a poet to describe the 2014 Vito. With a powerful-looking radiator grille, framed by sharply contoured, wing-shaped headlamps, the new Vito creates an assertive and unmistakable impression. 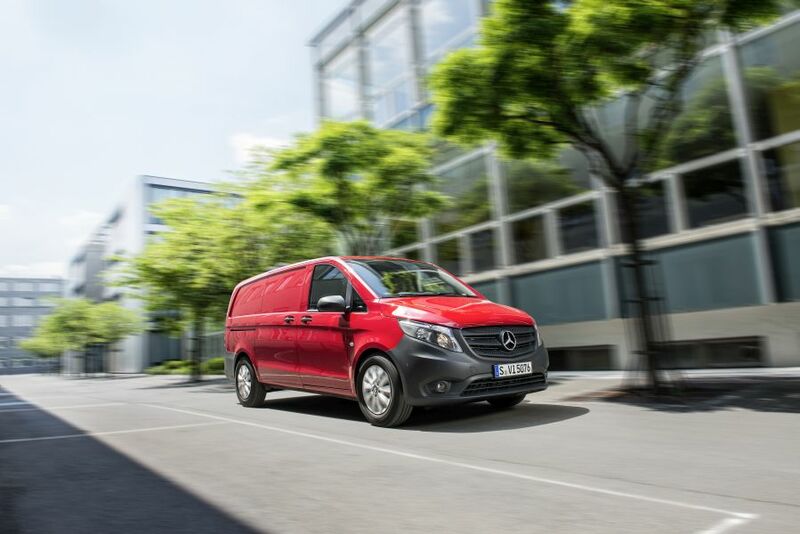 With its stylistic features, the van fits seamlessly into the large family of the commercial vehicles from Mercedes-Benz. Defining characteristics of this family are the three perforated slats in the new Vito’s radiator grille and the horizontal bumper with an additional air intake. Extending downwards with a striking shape, it gives the new Vito a sturdy look on the road. 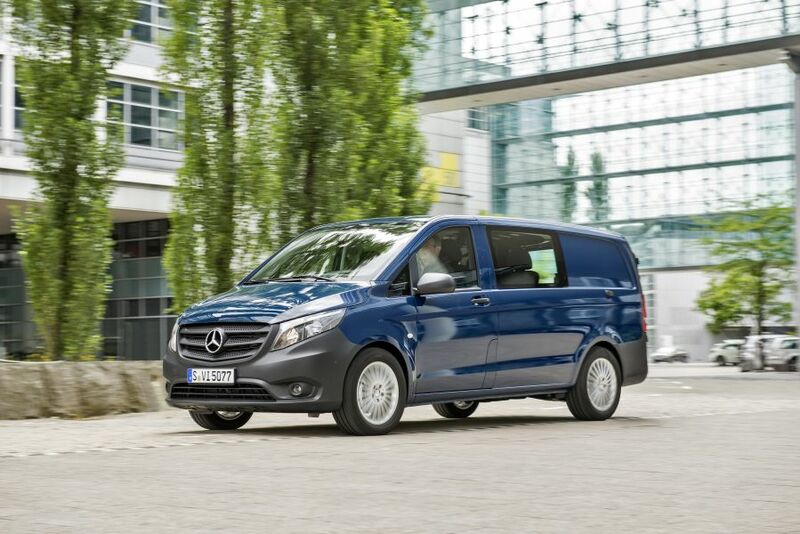 The bonnet of the new Vito is a dynamic arrow shaped one and constructed like a sculpture. With a Cd value of 0.32 wind resistance, it is very low. Also regarding the front part, the LED lights are offered optionally. This too, is more than a design feature – LED lights reduce electrical consumption. With a service life equivalent to the vehicle’s useful life, changing bulbs is largely a thing of the past. Now completely redesigned, the new Vito’s cockpit is exemplary in terms of functionality and ergonomics. Symmetrical in its fundamental form, the structure is clear and uncluttered for maximum operational safety. All controls are within easy reach of the driver. A great deal of attention has been paid to detail in the cockpit, which has an exceptionally high-quality look for this vehicle class. Renault and the Citroen-Fiat-Peugeot trio have really improved their (interior) vans, but still keep the distance. Like almost all the Mercedes-Benz passenger cars, the Vito has a space-saving foot-operated parking brake with a pedal on the left of the footwall. 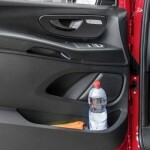 In versions without a partition or in the Vito Tourer, this arrangement facilitates access through to the rear. When developing the new cockpit, the stowage concept received plenty of attention. 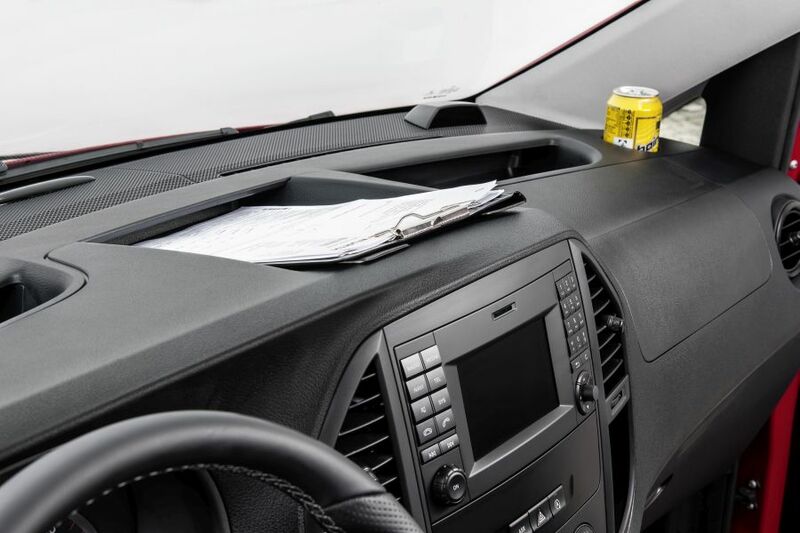 After all, for many drivers, the new Vito is their office and a living space, too. Three large, open stowage facilities at the top of the instrument panel, catch the eye. The angle and height of the three-spoke steering wheel are also adjustable as standard or as special equipment, depending on the model. As an upgrade, there is a multifunction steering wheel with trip computer. The gear knob resembles a joystick on the centre console. If the customer chooses the automatic transmission, the selector lever is formed like a steering-column lever to save space, while being conveniently placed. Both driver and passenger benefit from contoured seats in the new Vito. The seat cushion has grown; the backrest is also larger and has been moved up for distinct lateral support. Thanks to a curvature in the top section of the partition wall in the panel van, the backrest can now be tilted back 83 mm further than before. The driver’s seat is height-adjustable. It is the first vehicle in the Mercedes-Benz portfolio to be available with a choice of rear-wheel, all-wheel and now front-wheel drive. Another first for the vehicles bearing the star is the associated use in one and the same body of engines installed lengthwise for rear-wheel and all-wheel drive systems, as well as the transverse-mounted engines for front-wheel drive. To be fair, we have already seen something similar in the Transits. The new front-wheel drive system in the range is very light, when used in conjunction with a compact turbodiesel engine. 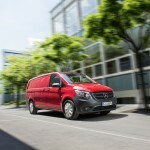 The payload advantage is 120 kg, compared to the previous model and some 60 kg on the new Vito with rear-wheel drive. When unladen or carrying only a light load, the front-wheel drive offers better traction. Proven rear-wheel drive is the right solution for all applications involving heavy weights, high towing capacities (up to 2500 kg), as well as the need for plenty of traction in these circumstances. 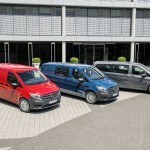 The new Vito with the rear-wheel drive is available in higher output ratings and can also be combined with an automatic transmission and the BlueEfficiency package. All-wheel drive is necessary when high traction is required, including in tough conditions or off surfaced roads. 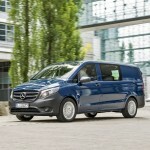 The new Vito with the all-wheel drive benefits from a high level of driving dynamics and stability. Due to the new integral design of the all-wheel drive, the vehicle height, load compartment sill and boarding height of the new Vito 4×4 are almost the same as in models with front and rear-wheel drive. Small, but mighty: the compact four-cylinder OM 622 turbodiesel unit, with a displacement of 1.6 litre, is a case study in systematic downsizing for low fuel consumption. Long maintenance intervals of max. 40,000 km or two years reduce costs and attest to the engine’s robustness. The engine meets the requirements of the Euro 5b+ emissions standard, as they currently stand. It is already ready for the future Euro 6 emissions standard. The exceptionally powerful Mercedes-Benz OM 651 engine is the right choice for rear-wheel and all-wheel drive versions. It works in practically every car or van from Mercedes-Benz – all the way up to the S-Class. The first engine complying with the Euro 6 emissions standard in this class. The new Vito comes with a six-speed manual transmission. The optional 7G-TRONIC PLUS automatic transmission with a torque converter is likewise designed for maximum fuel economy. It is available as an option for the OM 651 with the bottom and mid power rating and as standard for the most powerful version, as well as the Vito 4×4 with all-wheel drive. The world’s only automatic transmission with torque converter and seven gears for vans is employed for the first time in the Vito. The automatic transmission is combined with an Eco start/stop function. 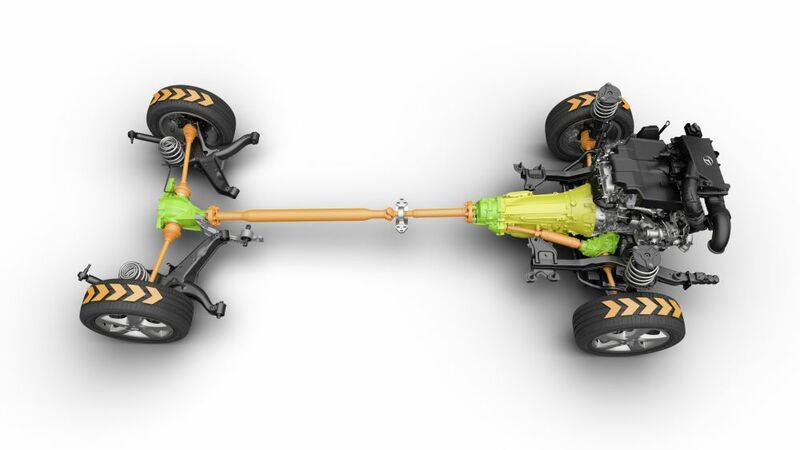 As before, the new Vito’s front axle is based on the McPherson struts with lower wishbones. 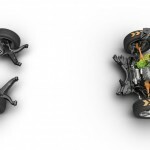 However, the front axle and engine are mounted more rigidly in their subframe. The drive unit is therefore effectively isolated from vibration. As previously, the Vito comes up with trumps on the rear axle, with independent wheel suspension on semi-trailing arms and coil springs. The spring and damper tuning is new. There are two basic configurations: the Vito panel van and the Mixto are set ups for high loads, while a comfort suspension is provided as an option for the Mixto and as standard on all Vito Tourer models. If desired, the new Vito can also be equipped with light-alloy wheels in the following sizes: 16 inch, 17 inch and 18 inch. The Mercedes-Benz Accessories range even includes 19 inch wheels. The Vito panel van is the only van in its class to provide airbags and a seat belt reminder for both the driver and passenger as standard. The Vito Tourer PRO and the Vito Tourer SELECT models also come with windowbags and thorax/pelvis sidebags in the front as standard. 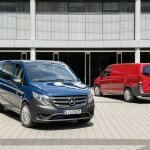 For the first time, it is possible to get windowbags in the rear for the new Vito Tourer. With up to eight airbags in total, the new Vito Tourer is the new benchmark for occupant protection. Uniquely in this class, the new Vito comes with Crosswind Assist as standard. Crosswind Assist virtually eliminates the effects of gusts acting on the vehicle. 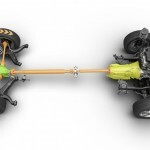 The required extent of countersteering was reduced, thereby markedly relieving the strain on the driver. Crosswind Assist builds on the standard electronic stability program (ESP) and is activated from a speed of 80 km/h. 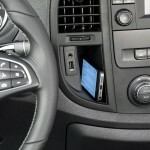 The new Vito may be equipped with other optional assistance systems to suit specific requirements. Optional Active Parking Assist is new and unique for vans. This feature identifies appropriately sized parking spaces up to a maximum speed of 30 km/h – these only need to be one metre longer than the vehicle. If the driver accepts the assistance system’s suggestion, all they have to do is engage the correct gear, and operate the accelerator (up to max. 10 km/h) and brake pedals. Parking Assist performs the necessary steering manoeuvres. In conjunction with an automatic transmission, the vehicle will even brake independently. Versions of the new Vito with front-wheel drive and the compact OM 622 turbodiesel engine make a clear statement on procurement alone: the attractive purchase price is significantly less than for the previous model. On average, consumption of diesel in the NEDC is some 20 percent less than for the preceding version. Depending on the model, the difference may amount to up to 32 percent. And last, but not least, the end-users also benefit from the Bodybuilder Centre at Mercedes-Benz Vans: the publicly available information portal www.vanpartner.com provides an overview of over 300 product solutions from more than 100 partners – already including numerous special versions for the Mercedes-Benz Vito. This is Not Your Ordinary Viano: It’s A 265 HP Diesel Van!